When the Istanbul Ataturk airport was attacked by terrorists on June 28, it hit too close to home for me. My daughter, Lizz, has been in that airport four times in the last six months. And I was frightened by the thought of what could have been. It hit home with Lizz, too, but in a very different way. She knew the people most hurt by the attack. She had sat in their tea rooms, shopped in their markets. She had shared their conversation, food and culture. And the terrorism didn’t make her want to stop traveling. On the contrary, it made her determined to revisit Turkey and support the people who depend on tourists for their livelihood. She is a member of the Millennial Generation, and globalization is its hallmark. As a parent of that generation, my hallmark is constant prayer. My children are products of the Catholic school system. They have been raised on the teachings of the Catholic Church. They have been taught to love their friends, their neighbors and even their enemies; to be the hands and feet of Christ pouring out his love to everyone they encounter. And they’ve learned the lesson well. Beginning with mission trips in high school, studies abroad in college and then employment in multinational corporations, technology has made our children’s reality international and world travel a part of life. My daughter Lizz is proof of this. And I fear for her as she explores the world almost as much as I admire her. One thing I know. I can’t stop her. When I was young, I remember coming across an article about the Fairy Chimneys of Cappadocia — surreal rock formations that served as homes and churches for Byzantine Christians thousand of years ago. The photography was stunning, and I looked at those pictures forever, charmed by their beauty and longing to visit that magical place. But traveling as far away as eastern Turkey was out of my realm of imagination. A few months ago, Lizz was flying over Cappadocia in a hot air balloon, admiring the fairy chimneys and sending me pictures so I could know she was living my dream. At the same time, ISIS was attacking Turkey on the Syrian border. She wasn’t afraid; and I lived vicariously through her Instagram posts, holding in my heart the anxiety that doesn’t seem to exist in her generation. She did come back. 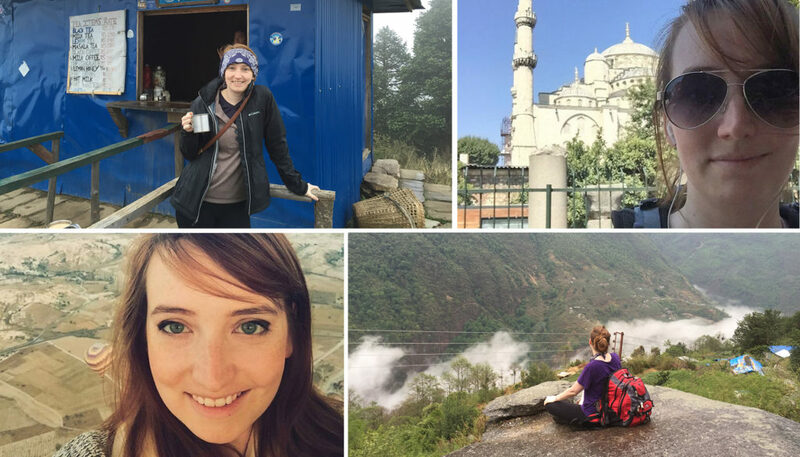 But a few months later, she would be flying through Istanbul again, on her way to trek the Himalayas, and to fall in love with the people of Nepal. I’m not alone in having a child who wanders the earth. Lizz has friends on mission trips, in work assignments and in religious orders spread throughout the world. They are exploring fearlessly, bound by the strength of their faith and Catholic convictions. Our anxieties won’t stop them, alarmist hype won’t stop them, and even terrorist threats won’t stop them. And so here’s how I cope with my millennial adventurer. I pray the rosary. I pray for her courage, strength, safety and continued love in the face of hatred. I pray that she will be part of our hope for the future, that her intent to live and love globally will defeat the evil of terrorism. Through Mary’s intercession, I have survived Lizz’s backpacking excursions through Europe, South America and Asia. And through Mary’s intercession, I truly believe our children can defeat terrorism with compassion, and unite the world in love. Your daughter has a beautiful attitude towards life. Her arms and heart are open wide to the world and all God’s people. What wonderful and loving parents she had to learn from.